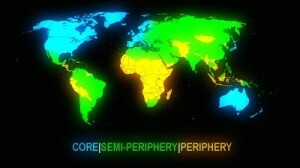 How can air traffic be used to identify global core, periphery and semi periphery? Do you agree with this description of the semi periphery? Why? What other factors could be used to global core, periphery and semi periphery? In groups: Come up with 5 other non traditional (not GDP) factors that could be used to identify the global core, semi-periphery and periphery. For each one, list the top and botom 10 countries for each factor. How could you find the semi-periphery using your index?